Appreciators relish detail. They follow the lines of interest and attraction as far as they can because observation, knowledge and reflection improve both the breadth and depth of experience. In addition to contemplating a finished photograph, which has been the emphasis of my offerings so far, I thought I’d provide some descriptions of going deep into aspects of the creative process itself. When I’m engaged with an image that has numinous potential, whether in the darkroom or in Adobe Lightroom, I turn off the stereo and dehumidifier. Although I sometimes use “daylight” tanks to process film—which allows the lights to be turned on periodically—I prefer to work in total darkness throughout the process. I forget the concerns of the day and go deeply into imaginative—contemplative—space. Einstein famously said, “Imagination is more important than knowledge.” Indeed. It is also true that knowledge of a subject feeds the imagination. For instance, the more I learn about photographic materials and processes—we had a class by that name at R.I.T.—the more adept I become at using them. Over time, as I shifted from the paradigm of “fine art photography” to my current approach, the knowledge and experience I gained triggered what I call immersive contemplations. Whatever subject or medium ignites your passion, I offer the following examples of immersive contemplation to show how knowledge and imagination can deepen your experience. Because most folks work in the digital domain, I include descriptions relating to both digital and chemical processes. In total darkness I slide a sheet of 4×5 film into clear water, a “pre-wash” that swells the gelatin emulsion so the film will more quickly and evenly absorb the developing solution. Like looking through a high-powered microscope, I see—imagine—the emulsion absorbing the water like a sponge. The anti-halation backing—a layer of dye between the emulsion and the acetate substrate that prevents light from reflecting back through the emulsion creating flare—dissolves and through agitation floats away in billowing red clouds. As the film is immersed in the developing solution, my imagination shifts to the equivalent of an electron microscope and I’m soaring as if on an underwater scooter. 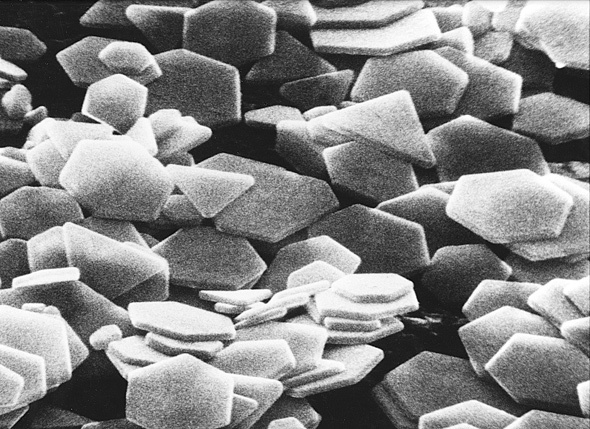 Like the animations we’ve seen of what it would be like to fly through the rings of Saturn, I’m moving through the gelatin, passing by a myriad of silver halide crystals, “T-grains,” looking like thin geometric icebergs. Their flat surfaces are ideal for absorbing radiant energy—light. I observe that the crystals are oxidizing, turning dark. Some more quickly than others. In one area the crystals are stacking up, others are clumping together into islands, some forming long filaments that assume the same degree of darkening. All around, as individual grains become more dense, the islands and filaments they’re attached to grow darker and darker. After six minutes or so the environment has become so dark it’s hard for me to see, so I turn the scooter sharply and speed up, heading in the direction of brighter islands. Like swimming from the depths of the ocean toward the surface, the gelatin world begins to brighten. Pausing in the darkness, I observe nearly blinding light ahead. 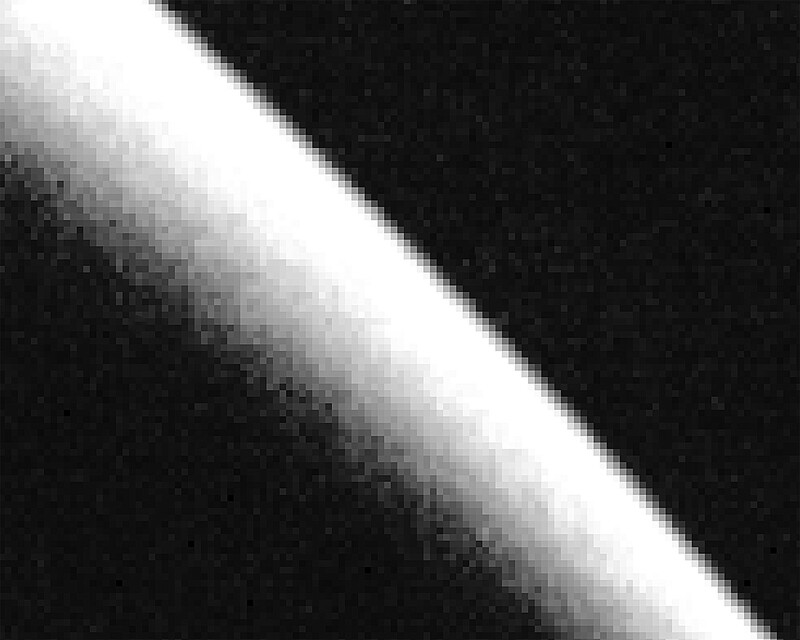 The transition appears to be gradual, but when I zoom out it’s a sharp edge. Contrast! 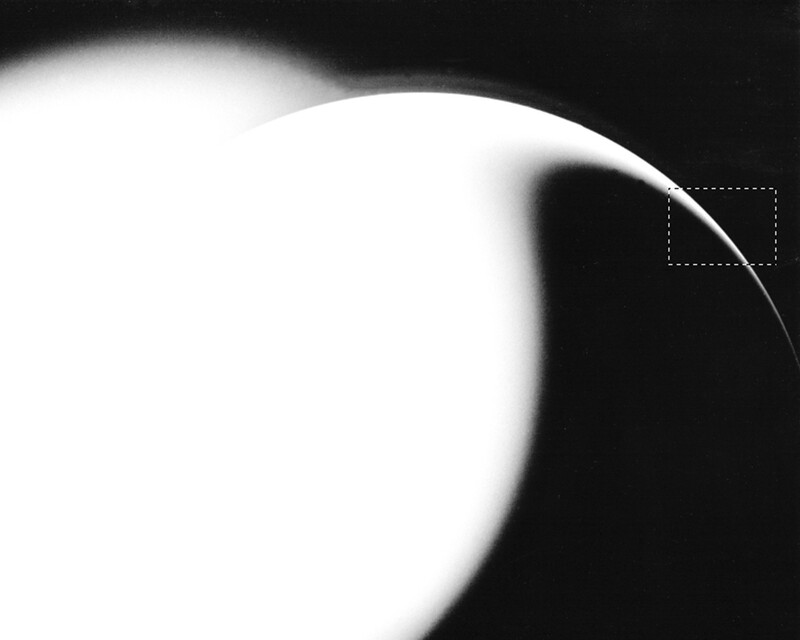 (See the dotted rectangle in the photograph of the sphere). Zooming back in, a single grain of silver halide catches my eye. I move closer to get a better look. The surface looks smooth, so I descend slowly, somewhat like a soft landing on one of the moons of Jupiter. Closer in, the surface appears to have grooves or channels. Closer yet, the landscape consists of mountains and valleys. And the grooves turn out to be striations, some of them deep crevasses. As I approach a particularly large one I’m feeling like Han Solo in the Millennium Falcon approaching the Death Star. What lies ahead is totally mysterious—and intriguing. The walls of this translucent domain look like Superman’s crystal palace, but with fewer and much smaller spires. Zooming in even further I detect movement, pulsing within the walls. The dance of molecules? Like the aurora borealis, the brightness and colors change. As I come out the other side of the crystal and look back, I notice dark places on the surface looking like blemishes. Curiously, they are the very places attracting neighboring crystals—like the way water vapor forms around a dust particle in the atmosphere to form a raindrop or snowflake. Suddenly, shockingly, I’m on the surface of the emulsion. The slippery and caustic environment I’d grown accustomed to suddenly becomes acetic when the film is placed in a weak acid solution to stop the development. Then comes another shock—a flood of sodium thiosulfate that washes away the crystals that were not exposed to light and makes those that were—the grains that turned gray or black—insensitive to light. At this point I turn on the room lights and wince because of the sudden brightness and the shift between worlds. When it comes time to print that negative, I remember the journey and begin another one as the photographic paper is exposed and immersed in the solutions. Sitting comfortably in front of my computer with an image on the screen that I particularly like, I use the image processing software—Adobe Lightroom in tandem with Photoshop—to magnify it 11:1 so I can discern the individual pixels. Moving this image to a place where there’s a distinct transition from light to dark tones or from one color to another, I focus my attention on a single pixel, and make it my avatar. 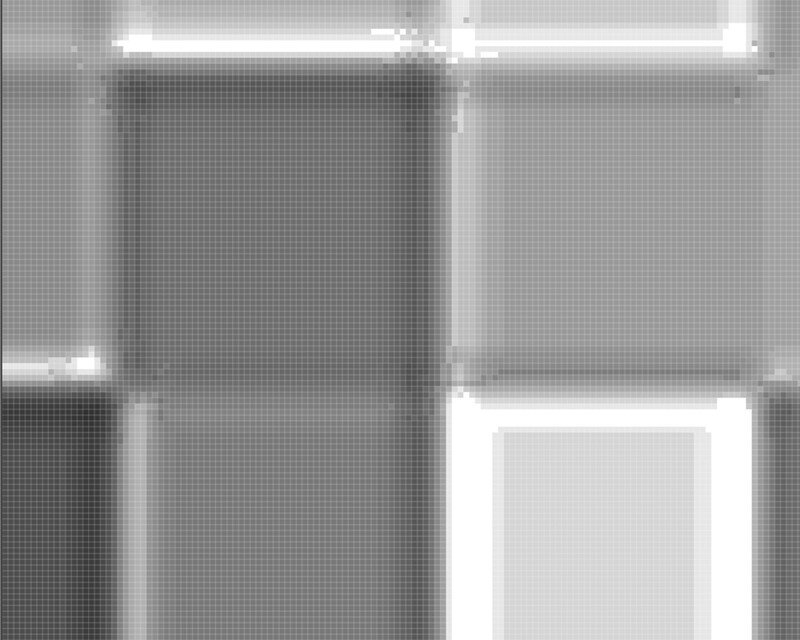 (Below, it’s the medium gray pixel, top right). I am surrounded by family avatars and a vast community of others. Some are darker than me, others are lighter. Because I’m familiar with the photograph, I see how well we fit together to form the whole image. We may be different but we are part of one whole, each in its proper place; each serving a unique and important function. Zooming out a bit I reflect on relationship and the significance of the whole (image/society) and the parts (pixel/individual). If my avatar or any of the others were missing or plucked out, the picture would not be the same. Literally, there would be a hole in it. And so my contemplation moves to considerations of community. Is it just a matter of proximity? What about shared interests? Diversity? Common goals or values? Respect? Connection? Zooming in again to consider just my avatar, I imagine the smaller, much smaller interacting and vibrating entities within—photons and electrons to name a few. Suddenly I’m reflecting on matters of constitution, identity and place. Am I just a composite of these vibrating forces? Is it simply my attributes that distinguish me from everyone else? Given that I can think, reflect and have preferences, is my rightful place where I happen to be? Or would I be more myself somewhere else? I increase the magnification and delve deeper. More again and I can barely find myself. Even more and I’m gone—yet the knowing that I am remains. To see myself whole again, all I have to do is shift my perspective—zoom out. And if I keep zooming out, I will see the entire image again—the whole world from the perspective of the avatar. At this point I close my eyes and assume a position in outer space where I can see the whole earth. No borders. No buildings. No people. Yet I am there. We are all there. I think about one of the observations of quantum physics, that we find what we’re looking for. And I’m prompted to ask: for what should I be looking? What do I want to see in me? What do I want to see in the world? This entry was posted in Uncategorized and tagged attraction, aurora borealis, avatar, chemical processes, contrast, crystals, Death Star, developer, digital domain, electrons, emulsion, Film, fine art photography, identity, Imagination, immersive contemplation, Jupiter, knowledge, Lightroom, Millennium Falcon, Numinous, observation, part-whole relationship, Photograph, photons, pixels, process, radiant energy, society, Superman. Bookmark the permalink. Thanks. This takes me back to the days of RIT photochemistry professor “Willie” Shoemaker’s subatomic diving helmets to visualize the process. As an engineer I still use this imaginative process when I work on projects. It helps to be inside a design to evaluate it and get a feel if it might work…and it can be done at night in the dark. For engineers and scientists imagination is often more important than knowledge having a vision drives us to use our knowledge to come up with ways to make things work…creating new knowledge along the way. 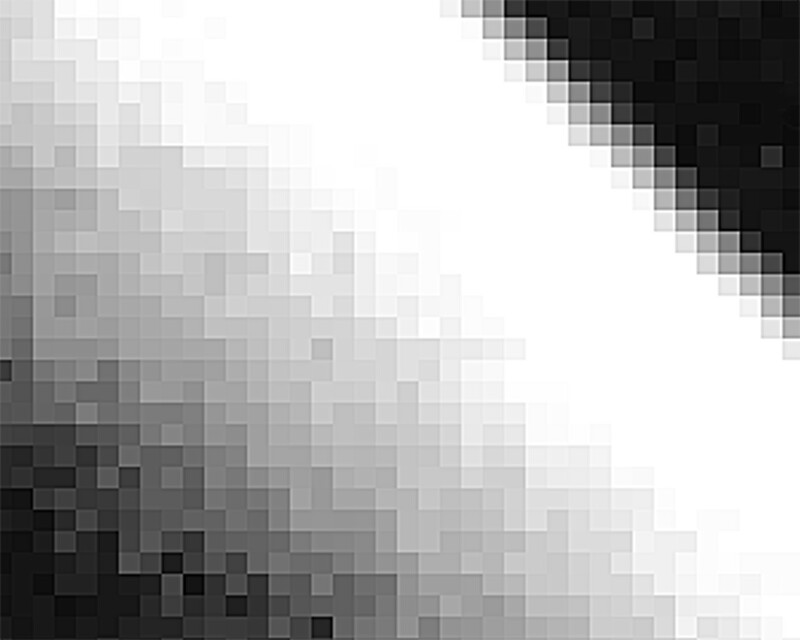 One technical correction from an engineer – the silver halide “T” crystals get reduced to dark silver not oxidized. Indeed, “Willie” Shoemaker was one of my favorite teachers. Photo Chemistry—what a great class! Thanks for the correction, Paul. Dark silver is an even better image. I was remembering “redox,” reduction-oxidation, so I need to go back (to the research) in order to polish the screen of my diving helmet. I also appreciate what you said about having a vision. Spot on!